The Rebel Sweetheart. 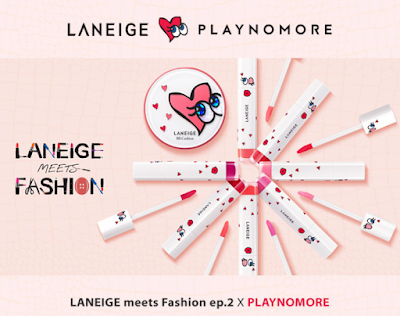 : Sneak Peek | Laneige x PLAYNOMORE My Darling, Shygirl Collection. Sneak Peek | Laneige x PLAYNOMORE My Darling, Shygirl Collection. I just realized I have not updated my blog in almost two weeks! Speaking of Korean dramas, I've got some exciting news for all the Kdrama/Kpop/Kbeauty fans out there! 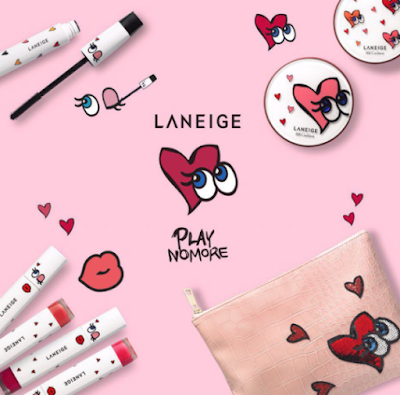 Laneige Meets Fashion - a yearly collaboration between Laneige and an up-and-coming fashion brand - is back, and this year they're teaming up with PLAYNOMORE, a Korean label that's all about 'having fun with fashion'. Launched in 2014, PLAYNOMORE illustrates contrasting concepts such as luxury versus affordability, and masculinity versus femininity with contemporary wit. The brand gained recognition with the release of the SHYGIRL bag, now an iconic 'it' bag in Korean fashion. A minimal square tote bag, the SHYGIRL is decorated with cute comic book style eyes in sequins and comes in various bright colours. For this collaboration, the signature SHYGIRL logo was given a makeover, adding a pink heart to the eyes of SHYGIRL. Hence, the birth of the My Darling, Shygirl - a makeup collection that screams of cuteness and femininity. Let's take a look at what this collection has to offer. First up is the Intense Lip Gel. 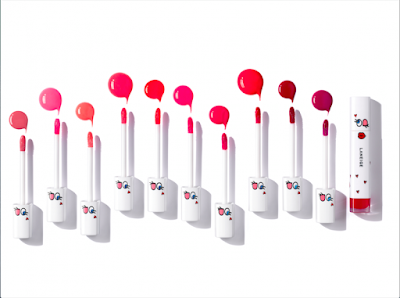 an all-new hybrid style formulated to maximize only the good features of a lip gloss and lipstick. Its texture possesses the moisturizing feel of a gloss while also giving off the clean applicability of a lipstick. The Intense Lip Gel has a non-sticky glossy shine and vivid colour payoff, and it also smoothes dead skin cells on the lips. Intense Lip Gel (25,000 Korean Won each). Also included in the collection is the Jet Curling Mascara, with its tube now adorned with cute little hearts and the signature SHYGIRL eyes. This mascara is God's gift to girls with short lashes, with its revolutionary air gel formula that allows for smoother application, added volume, and instant curl without making your lashes brittle. Jet Curling Mascara (27,000 Korean won). Finally, we have the BB Cushion, one of Laneige's most popular and well-loved beauty product. Like the mascara, the BB Cushion will also have the SHYGIRL eyes in its packaging. The BB Cushion is available in two shades - #13 Light Beige and #21 Natural Beige. 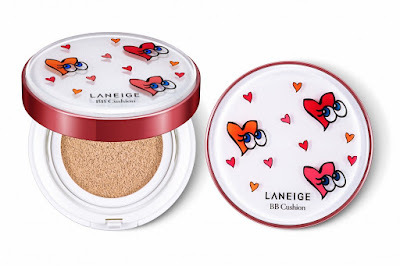 BB Cushion (37,000 Korean won). Laneige x PLAYNOMORE Kit (102,600 Korean won). Sorry to hear you were sick. We caught the same thing, I swear it rivaled the flu- it was intense and we all still have lingering coughs. Anyway, this is really popular brand in my daughters friends circle. I might pick her up some new lip color before she goes back to school. These look and sound like they are great products and so adorable too. 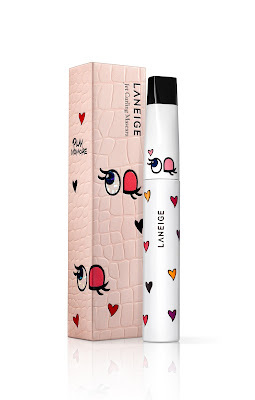 I love the cartoon eyes with the heart and I would love to try Intense Lip Gels. What a great collection indeed. Thanks for sharing. What cute packaging this is! I would love to try these beauty products! Those look so cute! I love the lip gloss colors. This looks like a cute maje up line. My daughter would love the cute designs. I love the look of the packaging. It is very cute and trendy. Great job. What a cute kit for girls. My granddaughters will love this. Hope you're feeling better now. Absolutely loving the packaging on these cosmetics. So cute, and different! I haven't heard of this. My sister and her friends are really into Korean dramas and related products though. I'll pass this information along to them! I would like to try that mascara. I'm always looking for one that I will love. Great mascara is hard to find. I love their cute packaging. Although it makes me feel like I would be getting a little girl's makeup kit. I'd love to try their mascara though.